TASK: Study biological organisms. Analyze. Correlate. Anthropology Your Borg present with any Borg in this hive may add their CUNNING to total wherever there is another Borg in same hive. This personnel allows your Borg to share CUNNING in the hive. Talon Drone, , CUNNING 5. If you bring the ship to the planet location (in the same hive), the CUNNING of the ship’s crew is added to the total CUNNING of the Away Team, giving the Away Team a total CUNNING of 32 when facing a dilemma. Likewise, the Away Team’s CUNNING is added to that of the ship’s crew, so the crew has an effective total CUNNING of 32. This has no effect on the CUNNING of each individual Borg. 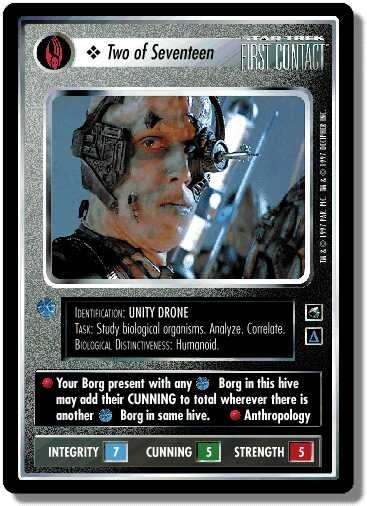 If the Bio-Med Drone is now killed, so there is no longer a Borg on the planet, the Away Team now has a total CUNNING of only 10, and the ship’s crew has a total CUNNING of only 17. There are 24 entries for Two of Seventeen (ST1E 4 C 93) at the Tradeplace (83 haves and 2 wants). Click here to see all trade list entries for this Common card!